John Griffiths is helped to the boundary after twisting his ankle while dropping a catch. The Nelson Cup this year became a bit of a lottery as Sunderland turned up with only 5 players meaning that the other two teams had to sacrifice two players each to make it a 9 a–side tournament (although Judd St ended up with 10 as they turned up with 12 players). We also might have been in that favourable position if the expected Pike had turned up but he was a no show and the London Saints Disciplinary Committee are still in deliberations about how long his ban should last!!! The main question of the day was how to choose the two players to loan out to Sunderland. As 9 of us were all changed and ready to start at the allotted start time of 1.00, it seemed an easy choice as the last two, his Lordship and the Wath appeared over the horizon carrying the kitbag. However the look that his Lordship gave the Skipper when the subject was broached said more than words could say. The look was interpreted as “If you think I’ve driven all the way from Dorset via Southampton to pick up the kitbag from Johnny Quinn to end up playing for another team, you’ve got another thing coming! !” The Skipper reached for Plan B from his ‘Art of Captaincy’ manual and approached debutant Dan Novakovic but before he could try and persuade Dan that it would be a good way to impress the team if he played against us, Dan volunteered his services for Sunderland. What a gesture, the boy will go far! – It would be an eventful afternoon for both of them – more later. Rather than trying to explain and follow the vagaries of this competition with 18 overs a side and Team A batting against Team B and then Team C batting against Team A etc, it will be shown in match order. In the first innings of the day the very strong Judd St set a very challenging total of 156 with Chris Wright hitting 77 not out and the Saints using all 8 bowlers with Johnny G cleaning up the tail with 3 wickets before Chris set about him. In the last over John was dispatched to very deep long on as Chris set loose. Mike ‘The Champ’ Mc set a trap which Chris took on hitting the ball about two miles in the air but coming down perfectly into the Ex Councillor’s hands. The ball, admittedly travelling at quite a speed, raced through his hands hitting him square in the chest (yes it left an impressive mark John!) causing him to become ‘unbalanced’ and in an attempt to retrieve the situation John stumbled then tripped and collapsed in a heap to great amusement. It was only after we realised that he was in great pain that the laughter stopped and he was carried off the field, not in the style of Freddie’s memorable sedan chair but dragged off between Lui and his Lordship. When we realised that his ankle was not broken and he could return soon, the incident quickly became a Champagne Moment contender. We put up an excellent batting performance beating our score of 83 from last year and average score of the high 90’s / low 100’s in this competition with two excellent performances from Lui Patel and Damian Chalmers. The rules of the competition mean that you have to retire at 50 (although you can come back if the rest of the team are out) and Lui continued from his excellent 85 not out v Sunderland (when he came back in) but this time he didn’t manage to get back in despite pleas from the ranks to the other batsmen to “Just get out to let Lui back in” We chased them close but ultimately their bowling was just a bit too strong for the rest of the team and we came up 17 runs short. Our highest ever score in the Nelson Cup at almost 9 an over, off 18 overs, showed Damian (who was out just before the retirement, and good average, score of 50) and Lui in sparkling form. With us down to 8 players and in effect all out and so Lui unable to return, Johnny G in a remarkable of heroism (aka Colin Cowdrey in 1963 ish – Eric will know – at Lords) volunteered to hobble out and, with a runner, keep one end going allowing Lui back in to score another 35 runs and set ourselves a formidable target. I don’t think even Sunderland in their wildest dreams would have matched our score but with Judd St having already retained the cup, both teams decided not to complete our ‘dead’ rubber as it was already nearly 7.30 and some people reminded the Skipper that it was either a long way back to Dorset or that the force of their better halves thumbprint was weighing heavily on their foreheads ! The main reason for us, though, was that we were down to 7 fit players with the Skipper joining John on the sidelines – more of that later. The main highlight of the innings though was the bowling of our would-be debutant Dan Novakovic. With both Dan and Wath excelling themselves batting for Sunderland v Judd St Tigers (more later), Dan dropping a couple of catches and then Wath joining DT and John on the sidelines with ‘old-age’ injuries, we didn’t fear their bowling too much. However Dan, determined to prove the Skipper wrong to give him a free transfer, proceeded to dismiss 3 London Saints stalwarts in Messers Pearce, Thomas and Keenan, the last two to particularly terrible shots. Desperate’s Revenge! and what a way to prove that he could be a useful asset to the Saints in future games – it has been noted Dan. So a long and eventful day, which in future should start earlier to get all the games in, but a useful exercise in blowing away any West Indian cobwebs any of us may have had. Man of the Match – No contest, Lui Patel with two almost chanceless unbeaten innings totalling 135. Special mention must be given also to Damian for his two innings. Champagne Moment – Dave Nanton’s 3rd duck in 4 innings and perhaps the years catching up on Tony with two run-out’s were batting lowlights. John’s calamitous attempts to catch the ball followed by his stumble and tumble would have scored 8.5 if on ice but not good enough to win this time around. John’s injury meant confusion in the ‘runners’ stakes with the team desperately not wanting Lord Lucan (who had just been dismissed) to be his (slow) runner – the Skipper stupidly agreed not realising that the greyhound that is Mike McIntyre, who makes Garry Burrell look slow, was at the other end. Mike not appreciating that the Skipper had just returned from two weeks on the beer and rum and who had just batted for his 22 runs (so not feeling the freshest in his life) called for a very quick single (ambitious in the minds of some) and proceeded to invalid the Skipper who pulled up with a thigh muscle strain leading to the call of “Can we have a runner for the runner”. You had to be there but even that did not win. 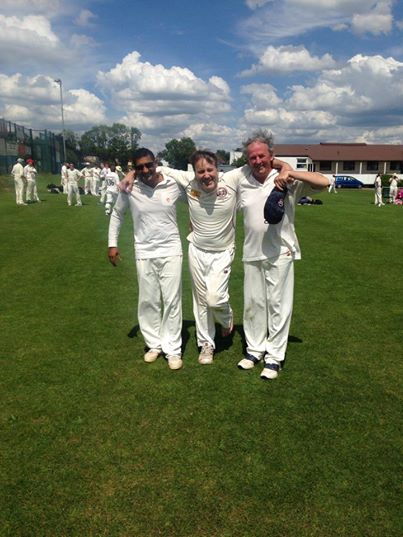 How could you beat London Saints being involved in a hat-trick – the first in Judd St’s history.